Our worship leader prayed for the persecuted Church this morning and, as he did so, I couldn’t help but think of what I have heard about the persecuted Church praying for us, that we will experience persecution so that the Church here can grow. That may sound funny since it seems like there is a church building on almost every corner, but there is more to being a part of the Church than just walking through the door of a building once or twice a week. Before you raise your hand and say, “I would,” evaluate the way you live your life. Have you truly surrendered every area to Him, making sure everything you do, say, and watch pleases Him? Sometimes I think it is easier to die for Him than it is to live for Him and, yet, if you don’t live for Him now, how do you expect to stand in the midst of persecution? Like most Americans, I have a pretty comfortable life. My needs are provided, I have a family who loves me and, therefore, much to be thankful for. I am very grateful that I don’t have to fear for my life, or the lives of my family members. At the same time, there should be nothing that I am unwilling to give up if God asks me to. Trust in God means knowing that He knows what’s best for me, and He has a plan whether I understand it or like it … or not. 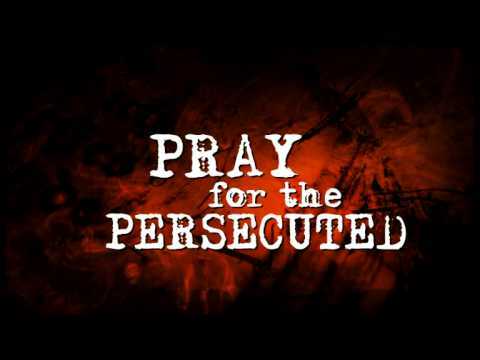 So today, I too am praying for the persecuted Church. May God continue to encourage them and give them grace to stay strong in the midst of the persecution. May He use them to draw others to Him, and may He have mercy on America. May we use our freedom, not for our own pleasure, but for His honor and glory. If we don’t, we very well may experience the horrible things our Brothers and Sisters in other countries are going through. Then we won’t be able to live lukewarm lives. We will either be on fire for God, or we will do what we need to in order to keep our comfortable lives and, in doing that, we will lose them. Please don’t wait until you are forced to make a decision. Decide today that nothing is more important than pleasing the Father who gave His only Son so that you could spend eternity with Him. He has given so much for you. Today, He asks you to give your life and everything you own back to Him. I pray you will say Yes. This entry was posted in Christian Persecution and tagged church, comfortable lives, Encouragement, Lord's will, Lukewarm, persecuted church, Persecution, Prayer. Bookmark the permalink. Yes! Live for God when times are good and when the going gets rough! Great post! I have long thought that it would be easier to die for Christ in a hostile country than to live for Christ in this one (US of A). Rather than have to stand up and face the music, we have to endure being ignored, looked down upon, passed over at work, misunderstood by loved ones, not willing to sell our souls for job advancement – death by a thousands cuts that reduce many to something like “Christian zombies”: having some appearance as saints of the living God but none of His power over the living death our society presents to us. Wow I was thinking the same thought concerning persecution and some people wanting to take heroic stance. If one is not living life to please Him now what makes one think they will be faithful when the persecutions come?